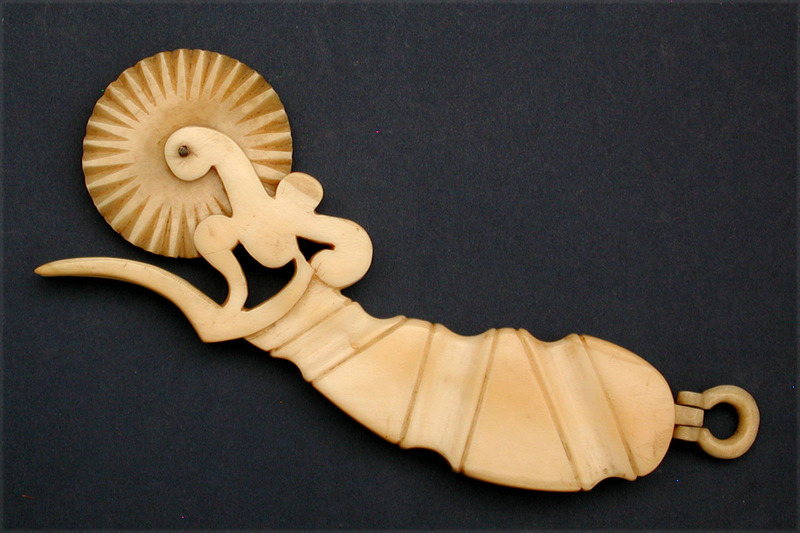 NICELY CARVED SCRIMSHAW PIE CRIMPER made entirely from whale ivory. The handle, including the wheel arms and fork, made from a single section of whale tooth. The pommel fitted with a well carved, pivoting shackle. 1 3/4" diameter serrated wheel. Handle portion carved with three deep cove and incised designs. Handle arms seem to have an early eagle motif. Overall length 6 1/4". Condition excellent noting an expert old repair to the fork tine. Excellent age color. Circa 1830-40. Another example by this maker recently sold at a Cape Cod auction for $3600.00. Has a custom display stand.